Maj. General Tom Katkus on board a C-130 en route to Venetie during Operation Santa on December 1, 2012. 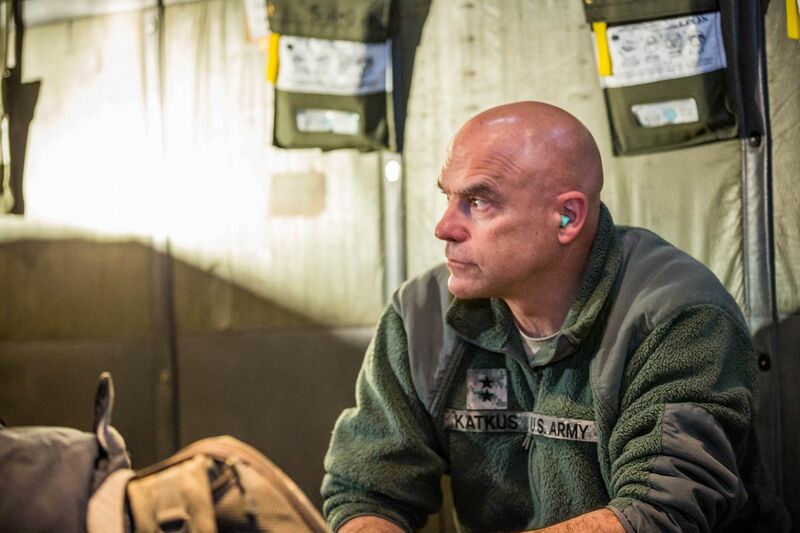 In a federal courtroom Friday, Maj. Gen. Thomas Katkus, the former adjutant general of the Alaska National Guard, said it was not true that he'd covered up and mishandled allegations of drug-dealing and sexual misconduct during his time as commander. Katkus's testimony, his first public statements on the matters since his forced resignation in 2014, came on the witness stand in a civil lawsuit. A former Anchorage police lieutenant, Anthony Henry, has sued the city of Anchorage alleging retaliation and wrongful termination. The city accused Henry of interfering with investigations into sexual assault and drug-dealing in the National Guard, and then lying about it. The National Guard scandal, as well as forcing Katkus' resignation, also cost Gov. Sean Parnell politically in his failed re-election campaign in 2014. Katkus is now retired and splits his time between Alaska and Arizona. Over several hours of questioning on Friday, Katkus appeared trim, dressed in a blue blazer and checkered shirt. He answered questions calmly. A former member of the Anchorage Police Department, Katkus said he has a good working relationship with law enforcement for sharing equipment and intelligence. He said it was important for him to know, as the top commander, about allegations of serious criminal activity involving Guard members. As a result of allegations levied against the Guard, Katkus said he had been the subject of several investigations. Those investigations never found that he had done anything criminal, illegal or unethical, he said. Katkus also said that until Friday, he had never seen any part the confidential report that led to Henry's firing and the secret suspension of Mark Mew in 2015. He said he didn't realize that he was being interviewed for it when he was cold-called by an Anchorage police investigator in October 2014, a few weeks after his resignation as the National Guard commander. The report, by former Pennsylvania state police officer Rick Brown, alleges Henry forced one of his subordinates to tell Katkus the name of a confidential informant. The informant was Lt. Col. Ken Blaylock, who has made a number of allegations against the Guard since the late 2000s, Henry's attorneys said in court Friday. Katkus said he could not recall any meeting where Henry requested information involving Blaylock. What he did remember, he said, was a meeting in February 2010 with a FBI agent, a state trooper and an APD officer and briefed on criminal actions by a member of the guard. He said he also remembered a June meeting with Blaylock after he said Blaylock asked a Guard member to meet with Anchorage Police officer Seth McMillan, potentially to discuss criminal activity in the Guard. The Guard member outranked the police officer, Katkus said. He said he wanted to talk to Blaylock about why he was "still inserting himself in concerns of the National Guard" and why he had ordered the officer to meet with McMillan. McMillan attended the meeting, and so did Henry, who was McMillan's supervisor. Both were in plainclothes, Katkus said. At the meeting, Blaylock said he knew the names of five sexual assault victims in the National Guard, Katkus said. Katkus acknowledged that he asked Blaylock for the names but said it was because he wanted to make sure the victims were taken care of. Blaylock refused to provide the names, Katkus said. Katkus insisted he had never discouraged the reporting of sexual assaults to law enforcement. He also said it was not "even remotely true" that Henry had called him and identified Blaylock as a confidential source for law enforcement. In fact, Katkus said he was the one who called Henry, in order to get McMillan's contact information and ask him to come to the meeting. Call logs displayed by Henry's defense attorneys in court appeared to corroborate Katkus' account, though David Parker, an attorney for the city, also showed call logs from Henry's phone that showed calls over two days in March 2010, including a call at 11:13 p.m. Katkus said he couldn't remember what the call would have been about. Katkus said he also could not remember a meeting with Henry, McMillan and another police officer, Jack Carson, where Carson said Henry forced him to reveal the identity of the recruiter as well as other Guard members who were involved in illegal drug trafficking. Katkus said he had made no unauthorized disclosures related to drug investigations. He also said he only became aware of allegations that he helped cover up drug and sexual assault investigations through Henry's defense attorneys. He also said he had been "very surprised" to hear he had been connected to Henry's firing. He said he was called out of the blue in October 2014 by Capt. Kevin Vandergriff, an Anchorage police internal affairs investigator apparently working with Rick Brown, the retired Pennsylvania state police trooper who was looking into the Henry allegations. Katkus said he wasn't aware he was being recorded or that his computer or phone records were subpoenaed by the police chief, Mark Mew. He said he wasn't asked to submit further background information beyond the call. If Vandergriff had asked him to come in for an interview, he would have, Katkus said. He said it was just a few weeks after he resigned from the Guard. "I'd just become unemployed," Katkus said. In September 2014, a report by the National Guard Bureau's Office of Complex Investigations described allegations of misconduct among the Alaska National Guard's recruitment division from 2008 to 2009. The report was critical of the process for reporting sexual assault within the Guard. In surveys, a "significant number" of respondents had perceptions about barriers to reporting sexual assaults and a lack of trust in commanders, the report said. The report spurred Parnell to ask for Katkus's resignation. Katkus said he had been aware rumors had been circulating related to sexual assault, but not specific complaints that he could act on. He said the report was an assessment, not an investigation, was intended to take the temperature of the organization. In court on Friday, Ray Brown, an attorney for Henry, displayed an inspector's general report that was conducted out of Washington D.C. He highlighted sections of the report relating to Katkus's conduct. "There were no instances where any sexual assault incident was covered up by MG Katkus or the chain of command," the report said. Investigators made a similar finding related to sexual harassment and said he actively supported and emphasized programs to prevent sexual assault and harassment. Katkus didn't cover up sexual assault and cases were forwarded to the proper authorities, based on the evidence, the report said. The report also said that investigators found no instances where Katkus failed to act on sexual misconduct.